I realized yesterday, with a slightly sinking feeling, that Wednesday was quickly approaching and I didn’t have much knitting progress to discuss. The shawl remains a shapeless blob of blue silk. And my current pair of socks remains unfinished. Still, I’ve made better progress on these than I did my last pair. There was a car trip to New Hampshire that involved quite a bit of knitting. And some time on the deck with them. A row here and there while waiting for a computer to reboot or a phone call to be returned. It all adds up. It doesn’t add up to much but it does add up. These will be finished in no time. Yup. No time. You’re still ahead of me. I had to rip from the toe back to the gusset. That’s what happens when mindless takes over and you gloss over the foot and go straight into the toe. Makes for an interesting sock to say the least-lol, though rather unwearable. Yes, a row here and there does add up. That’s what I keep telling myself as each row on my current shawl takes about 20 minutes. I’m loving it, but objects may appear closer to done than reality. Regularly remind myself that every stitch counts even if it takes me a year to knit something. Then everything is finished in a flurry and I’m left to start it all over again! You inspired me to go a few rounds with my second sock this morning too! We’ll all have fabulous new socks in September. We will. Really. Yep – all those little odd moments make a sock. Don’t feel so bad. I’m going in reverse. I am ripping out my almost finished shawl because I can’t stand the edging. Now THAT is slow progress. I might have the strength to talk about it on the blog tomorrow. A long time ago I decided that deadlines were for work and knitting was for fun and relaxation. It mostly works, although if necessary I occasionally give myself a knitting deadline. The colors in the socks are amazing–they look like a beautiful fall day! And it looks like you’re in the home stretch with that one! One day at a time, one stitch at a time. Happy Wednesday, Carole! Happy colors! You will be ready for fall when it comes (all too soon). 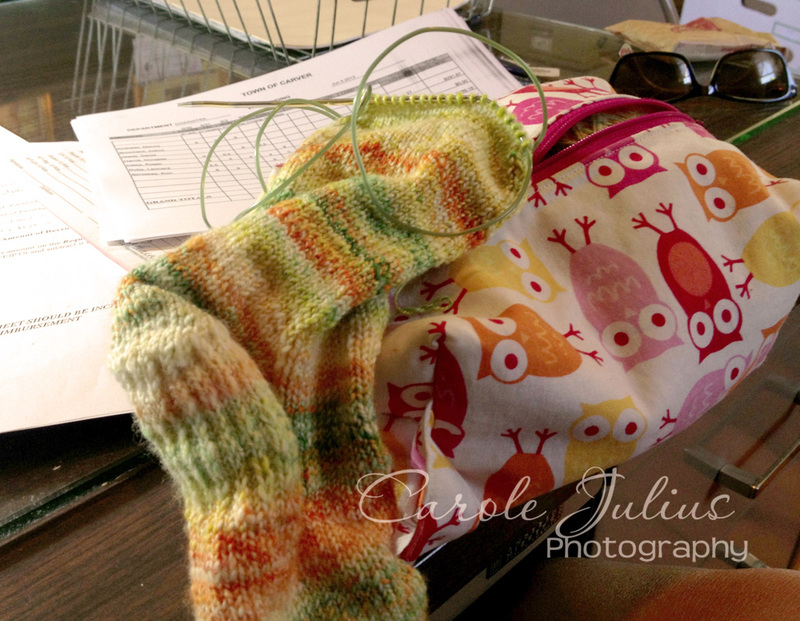 Pretty socks and love that owl bag! I love the colour of these socks. Very outdoorsy. any progress is forward progress! And your photo of magic loop reminded me of a student who wants to knit socks and hates dpn’s. I’m thinking you’d suggest magic loop but wonder did you also try two circulars?